The entire biblical text and the reading below are meant to be read aloud in the company of friends and fellow believers, followed by discussion, confession, and prayer. This is Palm Sunday’s Gospel Reading (option B) from John 12:12-16 in the Revised Common Lectionary. Have you ever seen an example of someone mixing up the symbols for two different things as though they both go together? For instance, your first-grade child brings home a picture of the Easter Bunny sitting next to Santa Clause, or (stick with me now, but) your Church puts up an American Flag in a prominent place, not far from the Cross in the church’s worship space. The second example is really much closer to what’s happening in this text in John’s gospel than the first one, but both make the point. Symbols are being used at a time when it does not seem appropriate to the occasion to convey powerful truths and unfolding realities, but it’s hard to know how they fit together, or if they even fit together at all. The Old Testament text quoted by John here is actually from Zechariah 9:9. Perhaps reading that will help set the stage for us to draw out the symbolic contrasts even more. Zechariah works hard to get the crowd excited at the beginning of this verse. You can almost see him in the center of the crowd, waving his hands and yelling at the top of his voice, urging them to “make some noise” for the King who is about to ride in. You can almost hear the crowd gasp, and then go awkwardly quiet as they look on, wondering and whispering how the image of a lowly man riding a donkey equates to the entrance of a righteous and victorious king. But that’s the image, with all its seemingly dissonant symbols, that Zechariah gives us — and that’s the one that Jesus embraces and acts out here in John’s Gospel just a few days before his crucifixion. It’s Passover, so… Happy Hannukah! Speaking of mixing up the symbols (or, perhaps, doing something different with them), let’s remember that all this festive celebration and lauding of Jesus as King was happening during Passover week (see Jn. 12:1, 12-15). 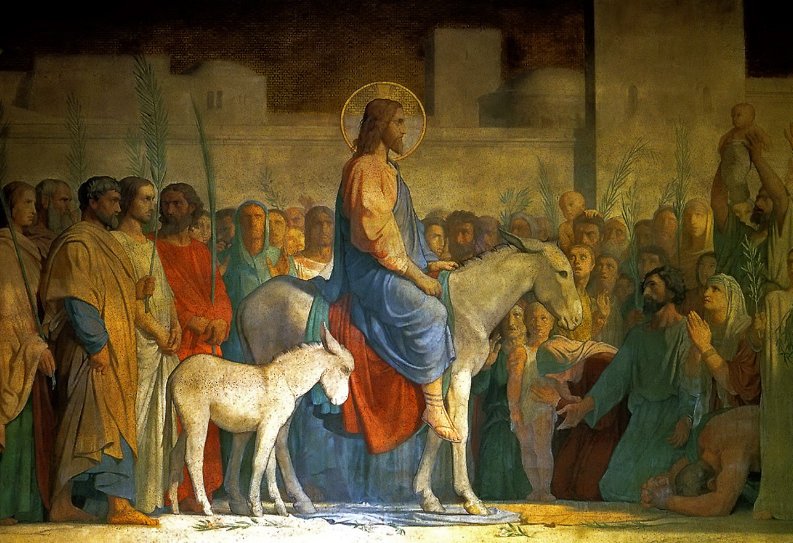 What is Jesus doing riding into Jerusalem before Passover, which is the celebration of Israel’s liberation from Egyptian slavery, and their exodus from Eygpt toward their own homeland? Parades for the King go with Passover a bit like the national anthem goes with a Christmas mass. 1 Maccabees 13:51-52 (NRSV) – On the twenty-third day of the second month, in the one hundred seventy-first year, the Jews entered it with praise and palm branches, and with harps and cymbals and stringed instruments, and with hymns and songs, because a great enemy had been crushed and removed from Israel. Simon decreed that every year they should celebrate this day with rejoicing. He strengthened the fortifications of the temple hill alongside the citadel, and he and his men lived there. 2 Maccabees 10:1-8 (NRSV) – Now Maccabeus and his followers, the Lord leading them on, recovered the temple and the city; they tore down the altars that had been built in the public square by the foreigners and also destroyed the sacred precincts. They purified the sanctuary, and made another altar of sacrifice; then, striking fire out of flint, they offered sacrifices, after a lapse of two years, and they offered incense and lighted lamps and set out the bread of the Presence. When they had done this, they fell prostrate and implored the Lord that they might never again fall into such misfortunes, but that, if they should ever sin, they might be disciplined by him with forbearance and not be handed over to blasphemous and barbarous nations. It happened that on the same day on which the sanctuary had been profaned by the foreigners, the purification of the sanctuary took place, that is, on the twenty-fifth day of the same month, which was Chislev. They celebrated it for eight days with rejoicing, in the manner of the festival of booths, remembering how not long before, during the festival of booths, they had been wandering in the mountains and caves like wild animals. Therefore, carrying ivy-wreathed wands and beautiful branches and also fronds of palm, they offered hymns of thanksgiving to him who had given success to the purifying of his own holy place. They decreed by public edict, ratified by vote, that the whole nation of the Jews should observe these days every year. In case you wonder where the Jewish holiday of Hannukah comes from, this is it! Israel had several generations before Jesus, seen a similar kind of messianic victory. All the big pieces were there: Triumph over the pagans, cleansing the defiled temple, re-dedication of the land and the temple and the people back to God (Hannukah means “dedication”), all followed by victory parades for their champion. All this had, no doubt, shaped Israel’s messianic expectations to the point that they believed they knew for certain exactly what Messiah must be like. Jesus, along with every other Jew in his generation, had likely heard these stories every year of his life. You could say that Jesus grew up knowing what Israel wanted, expected, or perhaps even demanded in a Messiah. Would he deliver? Yes and no. In John’s gospel, there are many opportunities for Jesus to re-enact and repeat the scenes from previous generations, giving them the kind of Messiah they had been anticipating. But at every turn, Jesus fails to make good on their expectations — on purpose! He constantly re-frames and subverts what it will mean to truly be God’s anointed hero. Second – upon arriving in the city, he announced that he (and not his or Israel’s enemies) would die, and spoke of his death as his glorification (Jn. 12:20-36). Talk about reversing expectations. What kind of messiah rides into town on a donkey (a lowly beast of burden), accepting the praises of the people and their acclamation that he is Israel’s King, and then tells everyone that he is about to be glorified… by dying?! This is not the kind of announcement anyone expected. Get the scene if you can. A donkey-riding peasant rabbi (not a wealthy and highly esteemed regal king) comes riding into Jerusalem not on a war horse, but on a donkey, weeping as he rides along (not pumping his fists or flashing his sword), and upon his arrival, announces that he is about to be glorified by dying at the hands of his enemies (rather than killing them and driving them out), and concluding that, therefore, everyone ought to give their allegiance to him as God’s own representative. Interestingly, John says that some people did just that, and others did not. In other words, some people got it! Jesus has taken familiar symbols from Israel’s own history (Hannukah) and re-framed them inside of another Holiday (Holy Day) — Passover. He was showing the people that the victory he would win would not be the same kind as the one gained those many generations earlier by Judas Maccabaeus or any other warrior-King. No, he would be the lowly king spoken about by Zechariah. He would be (as John the Baptizer called him at the beginning of John’s Gospel) “the Lamb of God” who takes away the sins of the world (Jn. 1:35).